Get Straight Teeth Faster With McDade Orthodontics in Santa Barbara, CA, Oxnard, CA & Camarillo, CA! 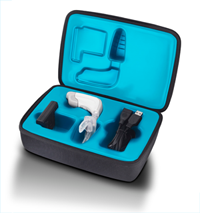 AcceleDent® Aura with SoftPulse Technology releases a safe and effective light force pulse that transmits through the roots of your teeth to the surrounding bone socket. This helps accelerate the cellular response and speeds the rate with your teeth can move. When used in conjunction with orthodontics, AcceleDent Aura has been clinically proven to move teeth up to 50% faster. “Crooked Teeth,” or Malocclusion, affects 74% of adults. With crooked teeth, it’s often more difficult to remove plaque and debris from between your teeth. If left untreated, there is an increase risk for tooth decay and periodontal disease. With recent advances in orthodontic technology, we now have the ability to straighten teeth in significantly less time. 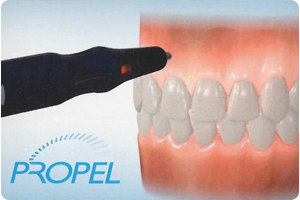 Propel is a micro-invasive treatment that use micro-osteoperforations to stimulate the bone to remodel faster and therefore “Excellerate” your tooth movement. Micro-osteoperforation with Propel offers a straightforward solution to your orthodontic need in just a few steps. Before Propel, rinse twice with chlorhexidine, a disinfectant. Your doctor anesthetizes the area and applies Propel where needed. Your doctor discusses options for your next visit, and you can get back to your busy schedule! See faster results without added discomfort or inconvenience. Use Propel with any type of orthodontic appliance, whether braces or aligners. Save time with fewer office visits. Forget surgery. Micro-Osteoperforation requires no recovery time. Is Accelerated Orthodontic Treatment Painful? Many patients who have experienced the acceleration devices feel that it makes the teeth feel better during and after the short 20 minute session. It prepares the bone so the teeth can move faster with less discomfort. Get Straight Teeth Faster With AcceleDent & Propel at McDade Orthodontics in Santa Barbara, CA, Oxnard, CA & Camarillo, CA! For 5-Star-Rated Orthodontic Care with Invisalign & Braces in Santa Barbara, CA, Oxnard, CA, Camarillo, CA, Ventura, CA, Ojai, CA, Goleta, CA, Monticito, CA, Carpinteria, CA, Thousand Oaks, CA & Newbury Park, CA, Call McDade Orthodontics Today! "We love this place...! Clean friendly and affordable." "Amazing service. Friendly people. Great orthodontist. Recommend to anyone." *The reviews listed are from actual patients of McDade Orthodontics. Individual results may vary. Reviews are not claimed to represent results for everyone. Dr. Mark McDade, our orthodontist in Camarillo, CA, Oxnard, CA, and Santa Barbara, CA, offers the most advanced braces for children, braces for teens and braces for adults. These types of braces include Invisalign, braces behind your teeth, clear braces and metal braces. Call (805) 485-3200 today for your free consultation for braces at our conveniently located Oxnard orthodontic office, Camarillo orthodontic office or our Santa Barbara orthodontic office. Come experience McDade Orthodontics, and you will see we offer innovative and effective orthodontics with a smile to patients in and around Camarillo, Oxnard, Santa Barbara, Ventura, Ojai, Goleta, Monticito, Carpinteria, Thousand Oaks, and Newbury Park, California (CA)!